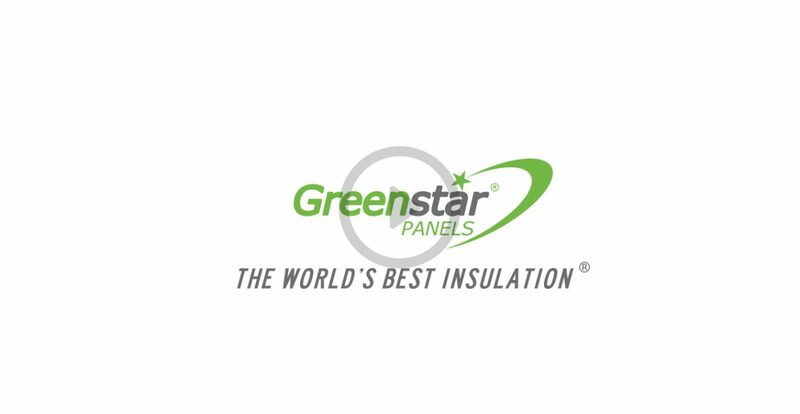 GreenStar Panels are designed to protect the building envelope in 3 ways and keep the heat from ever entering your attic. Typical attic though vented, can reach temperatures in excess of 160 degrees on a summer day. This heat works its way into the house making it hot an uncomfortable. Most of your electric costs are a result of trying to overcome that heat. GreenStar Panels have the solution by expelling the heat before it gets into your attic. Now your AC system operates in cooler attic which makes it more efficient and last longer. You can now utilize your attic space for additional storage uncluttering valuable living area. Aluminum reflects 97% of the sun’s radiant heat. But in the process the aluminum gets extremely hot. Touching a foil wrapped baked potato or foil wrapped corn cob just out of the oven would not be wise. If you do you could get burned. It would be much safer to use an oven mitt to protect your hand. A radiant barrier in an attic works the same way if not insulated. The aluminum’s surface temperature transfers the heat into your attic negating the radiant heat barrier’s effectiveness. When the radiant barrier is properly insulated and ventilated, the surface temperature of the roof will not have time to heat up you attic. The heat naturally moves upward through a 2” convection channel, effectively moving up and out before it can heat up your attic. The soffit vents pull cool air up through the air channel and out the roof ridge vent instead of entering your attic. 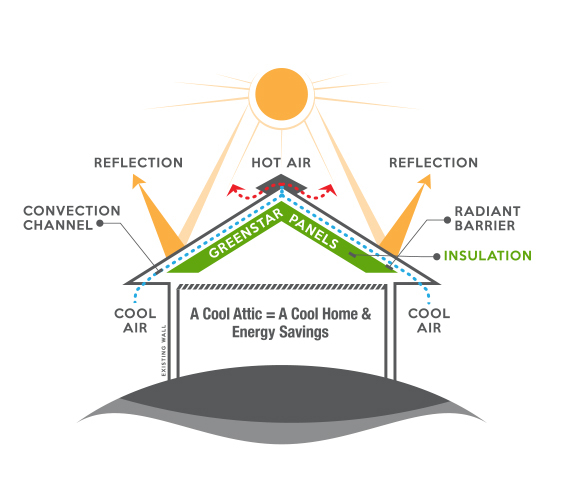 With our GreenStar Panel’s patent pending design, air is allowed to pass through an channel under the roof deck and above the 2” EPS insulation panel. This creates an air gap that prevents the sun’s radiant heat from heating your attic space. The use of a radiant barrier with insulation keeps surface heat from transferring much slower. Heat will eventually transfer into the attic with enough time. Air does not transfer heat through conduction making it a good insulator. The 2"inch airspace & radiant barrier combined with the 2-inch EPS panel will stop any measurable heat from entering the attic by conduction. Our 2” GreenStar Panels provide an effective R-38 against heat transfer with our Hyper-Insulated system. To understand EPS's conductive qualities you can compare it to a foam coffee cup. You can easily hold a foam cup filled with hot coffee but the same hot coffee in a metal cup could burn your hand. It's easy to see how EPS prevents conductive heat from entering into your attic. Manufactured from 1lbs density EPS foam (100% recyclable Expanded Polystyrene) with a foil facing reflective skin surface on front and back. Requires a vapor retarder (like gypsum wallboard). Also known as ‘closed-two pound foam made from raw biological materials.’ Closed- cell foam is a vapor retarder. A type of fiber primarily composed of glass, used in a wide variety of applications, and predominantly employed as a residential and commercial thermal insulator. In homes it can come in various hues and is commonly found in blanket form, called batts. It also comes in bags as loose fill that can be blown into attic.